“Versations resounds, echoes, and repeats in loud and soft—You almost cannot ever be the same once you’ve touched, felt and sensed this book… It touches, it should be touched. “Lehrer’s first book, versations was published in 1980. At the time, Lehrer was making street photography and became more interested in the things his subjects were saying to him and to other people in conversation than he was in the critical photographic moments he was capturing. He believes photography can be deceitful; a photographer can make a picture say what he or she wants it to say without really understanding the subject. Lehrer began carrying a tape recorder to document dialogue and study patterns of speech and transcribe them. Versations evolved from this material as a study in human speech and the poetics of human communication. There are 16 characters, who are involved in eight conversations. The book is trilingual (Chinese and French conversations are included). 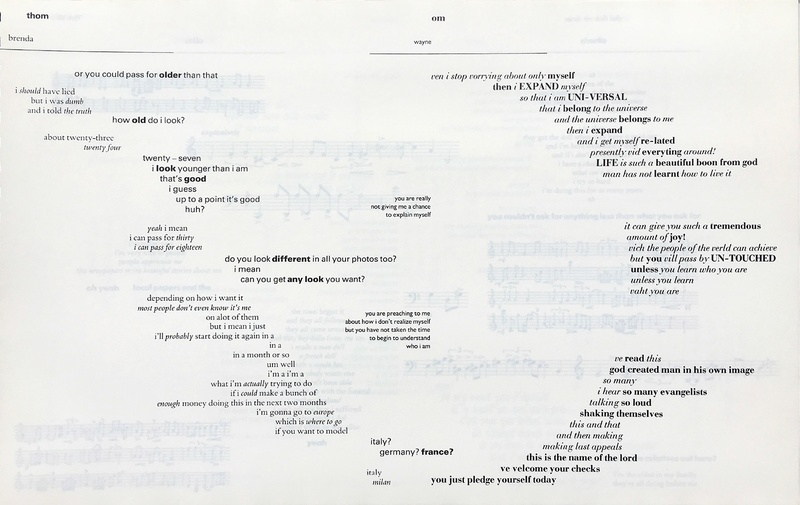 Lehrer recorded and had them tran-scribed because he wanted readers to see and experience conversations as form and music as well as their verbal content. 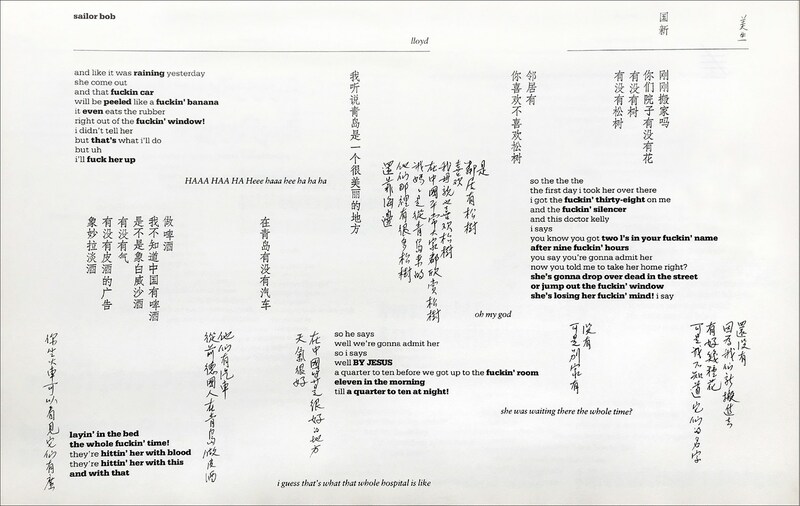 Each character’s words are set in a typeface or written script selected to express his or her nature. Seven of the conversations were transcribed from Lehrer’s tape recordings of real-life people, adding a documentary element of oral history to the book. Line breaks are determined by breathing pauses; bold and italic faces are used for emphasis. As with the later I mean you know and French Fries, the book becomes a play-book, for the conversations can be performed. 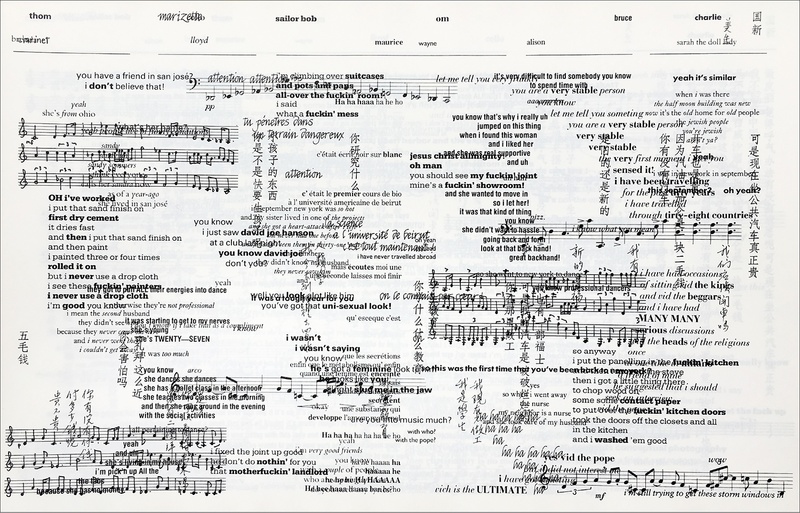 Lehrer organized versations’s complex pages as textural designs. 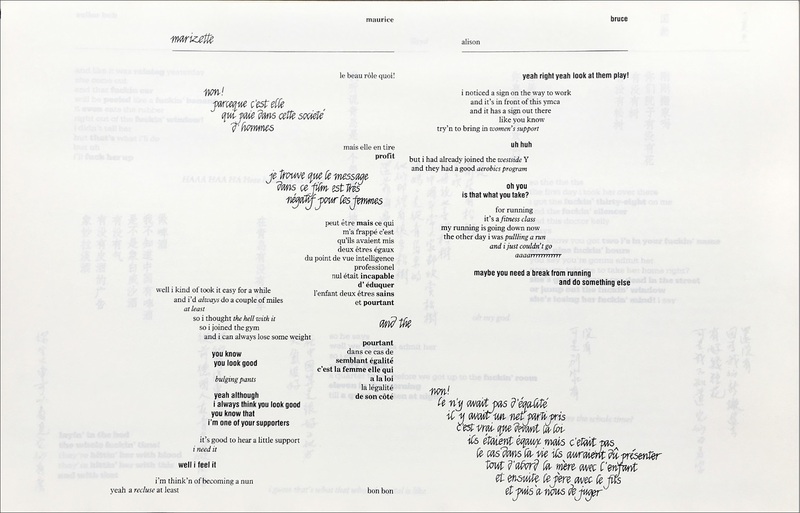 The typography loops down the page in open arcs, thrusts through the space in sharp diagonal slashes, and often intertwines with other conversations, just as multiple conversations occur simultaneously at a party or in the laundromat. 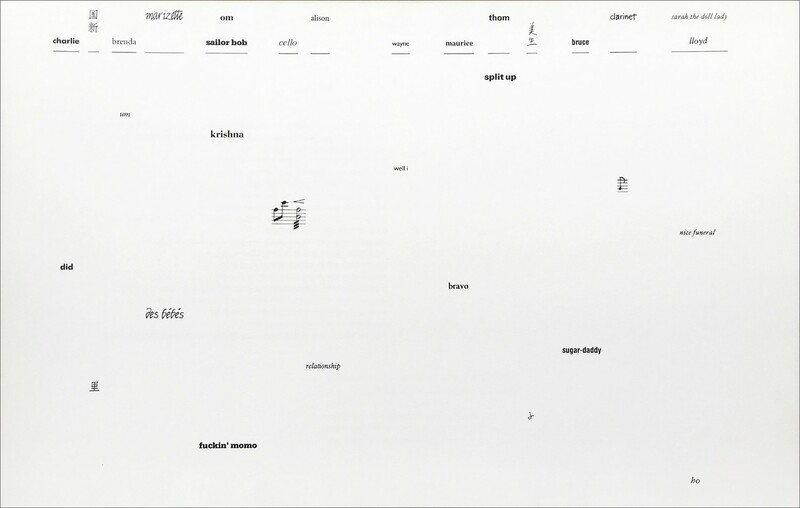 Although Lehrer’s pages might appear random or even disorderly to the casual browser or viewer looking at the sample pages reproduced here, they are highly structured and sequential. There is a grid structure, but it isn’t the vanilla grid of right angles; it is a dynamic/floating/flexible grid where horizontal, vertical, diagonal, and curved linear movements order and contain information. 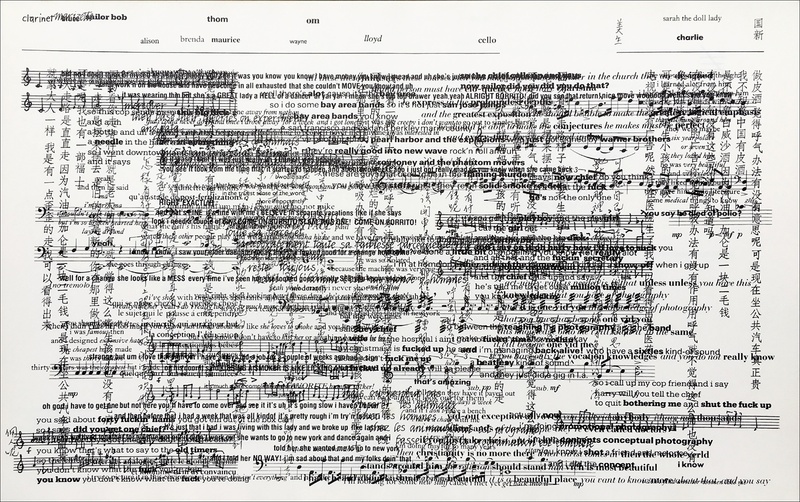 A sophisticated typographic and spatial system is used to encode information; each speaker in versations is identified by name just above his or her first line at the top of each page; the name is set in the typeface or writing style used for that character’s lines throughout the book. Readers who understand the system experience little trouble following the dialogue. As with Lehrer’s later books, one can respond to versations on several levels: as a narrative literary work; as a playbook to be performed; as sound poetry and word play; and as visual art to be seen and enjoyed for its visual properties such as space, color, and texture. Versations isn’t structured in the manner of a movie or novel with a tidy plot that resolves itself in the last few minutes or final pages; rather, it embraces the non-structure of life. The reader can pick it up anywhere and begin to read the conversations, just as one can drop in and out of the overheard conversations of fellow passengers on an airplane or bus. 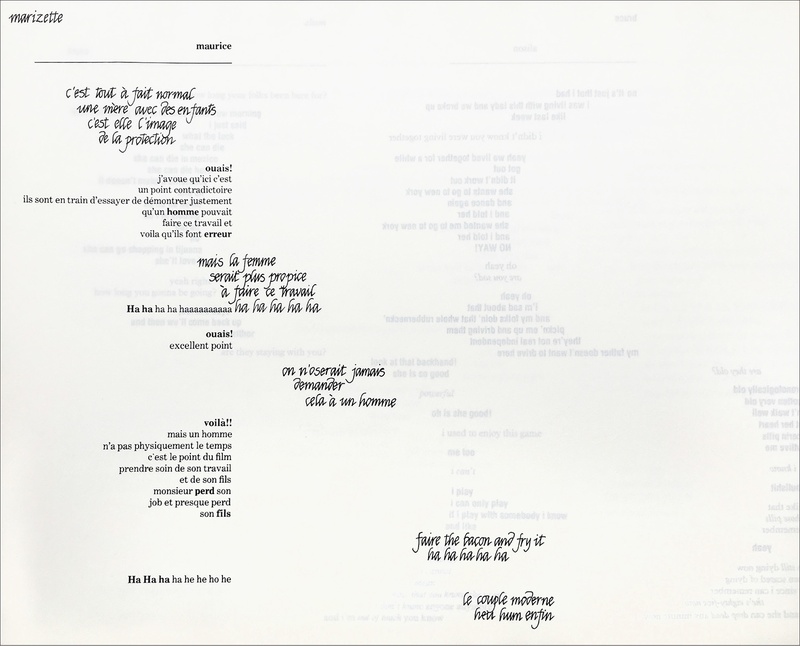 Lehrer used a translucent paper to transform that curse of printing, show-through, into a creative element. One sees through each sheet a sequence of the progressively lighter images of the next few pages, images that have been carefully orchestrated to become part of the design of each page. Lehrer says he wanted the reader to hear echoes of other voices while focusing in on one conversation at a time. 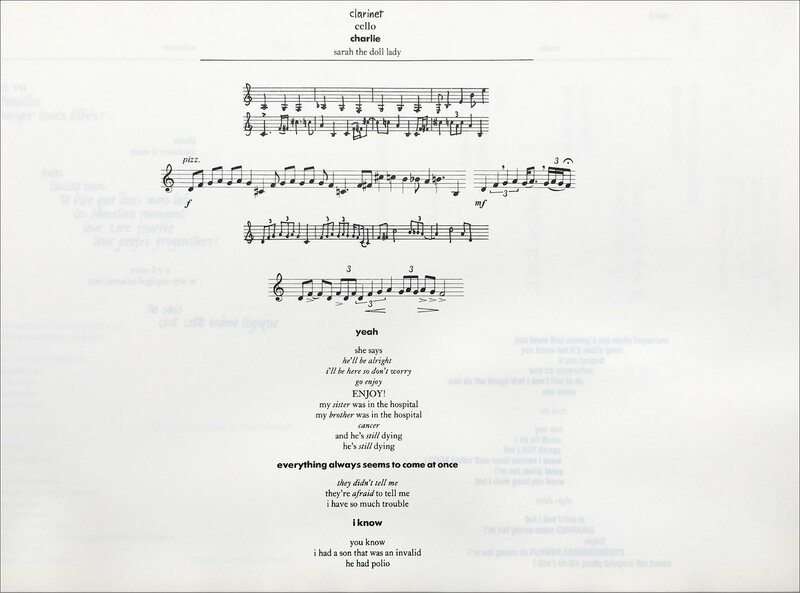 Book/performance score written and designed by Warren Lehrer. 10” x 16” x 96 pages. Hardcover, cloth over boards. Wiro bound. Printed in an edition of 300 copies, offset lithography on Cranes 100% rag paper, employing fourteen typefaces. 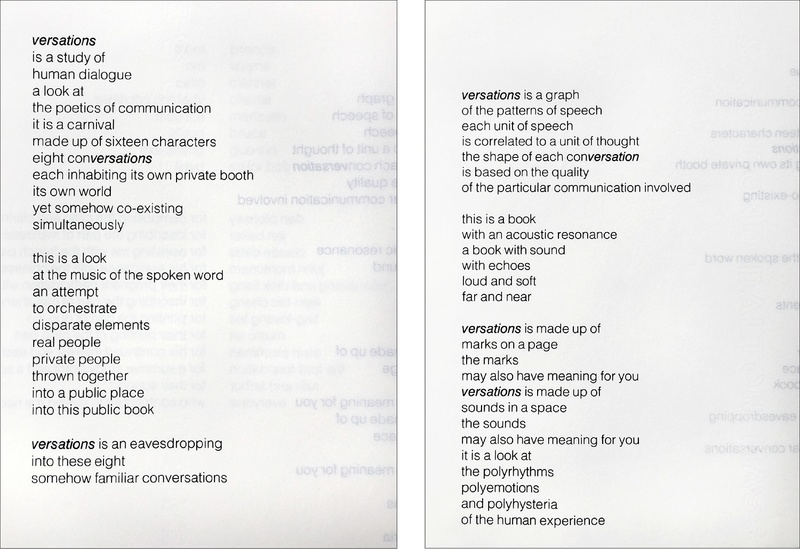 versations was Warren Lehrer’s first offset printed book, which grew out of his MFA thesis at Yale. It began his lifelong attempt to capture the rhythms and cadences of thought, speech, and interpersonal communication within the space/time capsule that is the book form. 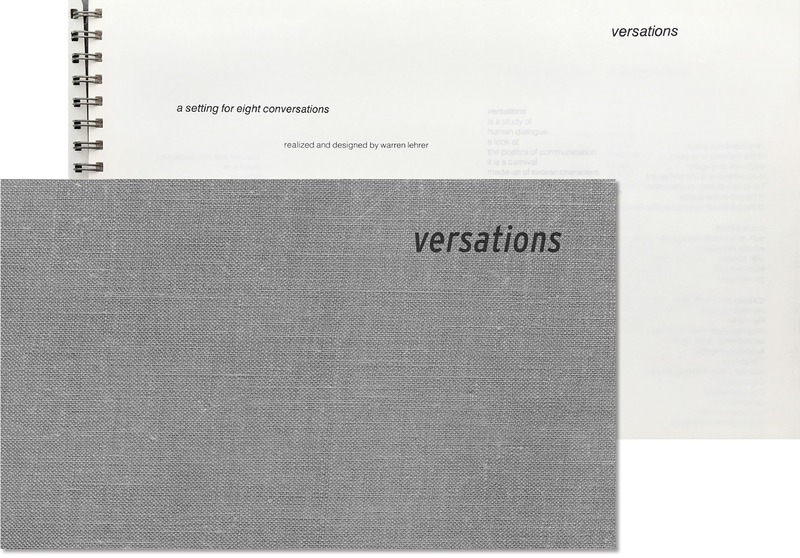 versations is a setting for sixteen characters, eight conversations. Sarah the Doll Lady discusses her life as a survivor and dollmaker, a Hindu missionary named Om professes universality, Sailor Bob confesses to wanting to murder his wife’s doctor, there is a Chinese love affair, a French flirtation, and a conversation between a clarinet and cello. The book functions both as a book to be read alone and as a score for performance (in eight movements). 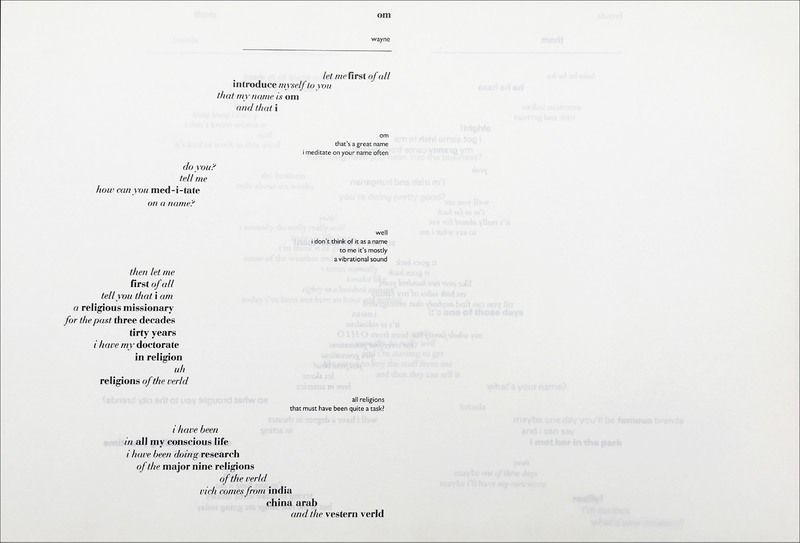 Printed on all rag, transluscent paper, its pages reveal the echoes of voices past, present, and future. Cited by Judith Hoffberg in the Umbrella newsletter as the first artist book and first MFA thesis to be awarded an AIGA Book Award.